These photos are flying around social media. I can’t confirm, but the story seems legit, with people saying the rack scores 206 or thereabouts, and that it will be at the upcoming Iowa Deer Classic. Does anybody know more about this buck? Please let me know. 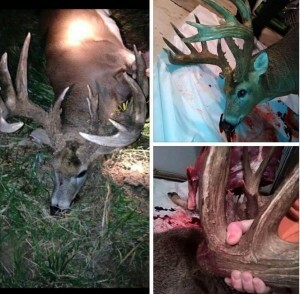 This entry was posted in Big Bucks by admin. Bookmark the permalink. Dude! I love to see racks with mass and this one is awesome . Lee to Tiffany, ” he needs another year”. Beautiful animal shame he met his demise like that. Can you imagine what that behemoth looked like in velvet? E Gads!